After slowly testing more interactive ads in recent months, Snapchat is open for ecommerce. Lancome and Target started running shoppable ads today within Cosmopolitan's Discover channel—the hub of the app where media brands publish daily stories. 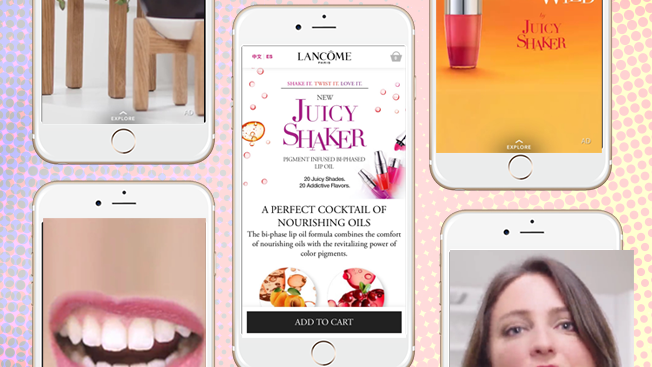 Like Discover's other ads, Lancome and Target's promos appear between Cosmo's articles and videos, each with a 10-second call-to-action instructing viewers to "swipe up" for more. Copy on Target's ad reads, "New products every week." Swiping down on the screen pulls up a loading page with Target's mobile site where people can shop the products featured in the ad—like plant stands and water bottles. Lancome's ad promotes a lip product called Juicy Shaker. Similar to Target's ad, people can shop the beauty company's site without leaving Snapchat. While creative on Snapchat is still relatively limited—ads, just like content, are capped at 10 seconds—Snapchat has experimented over the past few months with similar ads that ask consumers to 'swipe up" for more content. In November, Activision tested the first longer-length video on the platform, and a number of advertisers—particularly entertainment brands—have run similar campaigns since then. Then in February, mobile game Cookie Jam became the first advertiser to run app-install ads. Shortly afterward, shopping app Spring and ticketing company Gametime ran app-based campaigns, indicating that ecommerce ads may be coming soon. Last month, AT&T tested another type of swipeable ad with an article attached that's akin to a piece of branded content. It's been a busy week for Snapchat. On Thursday, the app announced users watch 10 billion videos every day, and 60 percent of its daily active users create content every day. The messaging app also inked a deal with NBC to broadcast clips from the upcoming 2016 Summer Olympics in Rio.